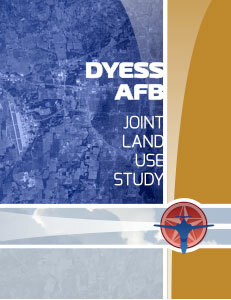 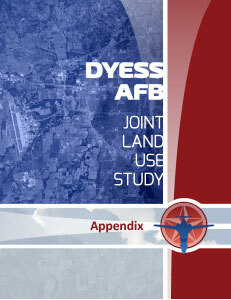 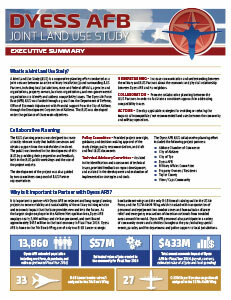 On January 9, 2018, the Final JLUS was formally accepted by the Joint Land Use Study (JLUS) Policy Committee comprised of representatives from the JLUS partners: City of Abilene, City of Tye, Taylor County, View / Caps Community and Dyess Air Force Base. 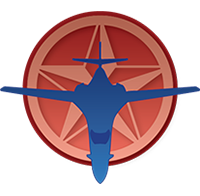 The JLUS partners wish to recognize and thank all the residents, property owners, community leaders, and other stakeholders for their participation in this collaborative effort in developing the JLUS. The final JLUS report and supporting documents are available for download via the links below.